Join Us!!! We are looking for someone to help us cover Ugandan basketball. Please send us an e-mail. Tonight see the sponsors of Friday Night Light (FNL) Season 8 battling it out on court again as the season comes to a climax. Last Friday, the corporate basketball battles saw Roke Telecom 'boss' fellow sponsors of the event that include Tusker Lite and NXT Radio in their encounters that ended; Roke Telecom 13-7 Tusker Lite, NXT Radio 8-6 Tusker Lite and Roke Telecom 19-16 NXT Radio. In the main action, Team Enabu was consigned to waiting for next year's edition by Team Madol in a 21-16 defeat, while Team Ikong ousted Team Fahmy in a 17-14 win. Team Zama matched past Team Soro in a 11-9 win and the last game of the night saw Team Flirsh narrowly overcome Team Kikiri in a 17-16 victory. Four teams Madol, Ikong, Zama and Flirsh will play in the semis and final today as the fun-filled edition climaxes. The winning team will bag a grand prize from the events main sponsor, Tusker Lite and other teams will bow out with plenty of gifts too. As the eighth season comes to an end, the sponsors have promised more fun and entertainment at the games. Meanwhile musician Nina Roz will be performing alongside DJ Simples. Tickets to the game will be sold at the gate for Shs5,000 and Shs20,000 for VIP which comes with four beers. The finale is one not to miss for fans of hoops and music. Levitec Huesca (LEB Gold) added to their roster 29-year old Ugandan international swingman Robinson Opong (190-95kg-89, college: Rogers State, agency: Duran International). He just played at Fer.Beira in Mozambican D1 league. In three games he recorded 13.0ppg, 9.0rpg and 1.0apg this season. Opong also played for Halifax Hurricanes in Canadian NBL Canada. The list of the past achievements is quite long as among others his team made it to the Spanish LEB Silver Play-Off Semifinals in 2018. Opong was also voted Afrobasket.com All-African Champions Cup Honorable Mention in 2017. He represented Uganda at the Afrobasket Championships two years ago. His stats at that event were 3 games: Score-4 (15.3ppg), 5.0rpg, 1.3apg, 1.7spg, FGP: 45.5%, 3PT: 28.6%, FT: 66.7%. Opong's career allowed him to visit three different continents. He tasted the life as pro basketball player in Europe, Africa and of course North America. 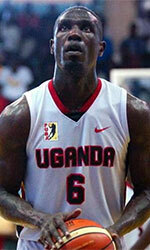 Opong has played previously professionally in Lebanon, Spain (Fontedoso Carrefour) and Uganda (City Oilers). He attended Rogers State until 2014 and it is his fifth season as a professional player. On Opong: A big guard who can score, shooting well from outside. He's now became a huge three-pointer specialist. 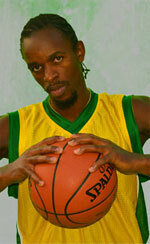 JKL Dolphins Kampala (NBL) strengthened their roster with addition of 32-year old power forward Bernard Okumu (86). He played last summer at UPDF Tomahawks. Okumu has spent his entire career in Uganda playing for three other teams: Heaters, Vegeterians and Diamond.